The citric acid cycle is a series of reactions that produces two carbon dioxide molecules, one GTP/ATP, and reduced forms of NADH and FADH2. The four-carbon molecule, oxaloacetate, that began the cycle is regenerated after the eight steps of the citric acid cycle. The eight steps of the citric acid cycle are a series of redox, dehydration, hydration, and decarboxylation reactions. Each turn of the cycle forms one GTP or ATP as well as three NADH molecules and one FADH2 molecule, which will be used in further steps of cellular respiration to produce ATP for the cell. Like the conversion of pyruvate to acetyl CoA, the citric acid cycle takes place in the matrix of the mitochondria. Almost all of the enzymes of the citric acid cycle are soluble, with the single exception of the enzyme succinate dehydrogenase, which is embedded in the inner membrane of the mitochondrion. Unlike glycolysis, the citric acid cycle is a closed loop: the last part of the pathway regenerates the compound used in the first step. The eight steps of the cycle are a series of redox, dehydration, hydration, and decarboxylation reactions that produce two carbon dioxide molecules, one GTP/ATP, and reduced forms of NADH and FADH2. This is considered an aerobic pathway because the NADH and FADH2 produced must transfer their electrons to the next pathway in the system, which will use oxygen. If this transfer does not occur, the oxidation steps of the citric acid cycle also do not occur. Note that the citric acid cycle produces very little ATP directly and does not directly consume oxygen. The citric acid cycle: In the citric acid cycle, the acetyl group from acetyl CoA is attached to a four-carbon oxaloacetate molecule to form a six-carbon citrate molecule. Through a series of steps, citrate is oxidized, releasing two carbon dioxide molecules for each acetyl group fed into the cycle. In the process, three NAD+ molecules are reduced to NADH, one FAD molecule is reduced to FADH2, and one ATP or GTP (depending on the cell type) is produced (by substrate-level phosphorylation). Because the final product of the citric acid cycle is also the first reactant, the cycle runs continuously in the presence of sufficient reactants. Step 1. The first step is a condensation step, combining the two-carbon acetyl group (from acetyl CoA) with a four-carbon oxaloacetate molecule to form a six-carbon molecule of citrate. CoA is bound to a sulfhydryl group (-SH) and diffuses away to eventually combine with another acetyl group. This step is irreversible because it is highly exergonic. The rate of this reaction is controlled by negative feedback and the amount of ATP available. If ATP levels increase, the rate of this reaction decreases. If ATP is in short supply, the rate increases. Step 2. Citrate loses one water molecule and gains another as citrate is converted into its isomer, isocitrate. Steps 3 and 4. In step three, isocitrate is oxidized, producing a five-carbon molecule, α-ketoglutarate, together with a molecule of CO2and two electrons, which reduce NAD+ to NADH. This step is also regulated by negative feedback from ATP and NADH and by a positive effect of ADP. Steps three and four are both oxidation and decarboxylation steps, which release electrons that reduce NAD+ to NADH and release carboxyl groups that form CO2 molecules. α-Ketoglutarate is the product of step three, and a succinyl group is the product of step four. CoA binds the succinyl group to form succinyl CoA. The enzyme that catalyzes step four is regulated by feedback inhibition of ATP, succinyl CoA, and NADH. Step 5. A phosphate group is substituted for coenzyme A, and a high- energy bond is formed. This energy is used in substrate-level phosphorylation (during the conversion of the succinyl group to succinate) to form either guanine triphosphate (GTP) or ATP. There are two forms of the enzyme, called isoenzymes, for this step, depending upon the type of animal tissue in which they are found. One form is found in tissues that use large amounts of ATP, such as heart and skeletal muscle. This form produces ATP. The second form of the enzyme is found in tissues that have a high number of anabolic pathways, such as liver. This form produces GTP. GTP is energetically equivalent to ATP; however, its use is more restricted. In particular, protein synthesis primarily uses GTP. Step 6. Step six is a dehydration process that converts succinate into fumarate. Two hydrogen atoms are transferred to FAD, producing FADH2. The energy contained in the electrons of these atoms is insufficient to reduce NAD+ but adequate to reduce FAD. Unlike NADH, this carrier remains attached to the enzyme and transfers the electrons to the electron transport chain directly. This process is made possible by the localization of the enzyme catalyzing this step inside the inner membrane of the mitochondrion. Step 7. Water is added to fumarate during step seven, and malate is produced. 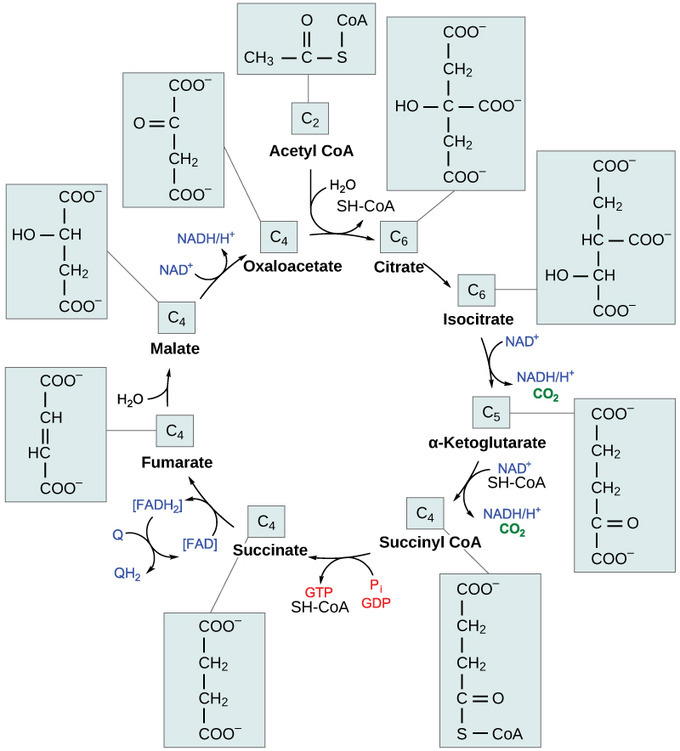 The last step in the citric acid cycle regenerates oxaloacetate by oxidizing malate. Another molecule of NADH is produced. Two carbon atoms come into the citric acid cycle from each acetyl group, representing four out of the six carbons of one glucose molecule. Two carbon dioxide molecules are released on each turn of the cycle; however, these do not necessarily contain the most recently-added carbon atoms. The two acetyl carbon atoms will eventually be released on later turns of the cycle; thus, all six carbon atoms from the original glucose molecule are eventually incorporated into carbon dioxide. Each turn of the cycle forms three NADH molecules and one FADH2 molecule. These carriers will connect with the last portion of aerobic respiration to produce ATP molecules. One GTP or ATP is also made in each cycle. Several of the intermediate compounds in the citric acid cycle can be used in synthesizing non-essential amino acids; therefore, the cycle is amphibolic (both catabolic and anabolic).